tChess Pro is the high-quality, critically-acclaimed chess app with the richest feature set available on the iPhone. It's perfect for beginners, experts, and enthusiasts. Beginners: Not everybody is a chess master! tChess Pro has unique algorithms to provide a fun, challenging opponent specifically for beginners. Most programs just make random mistakes at their easier levels--not fun! Enthusiasts: tChess Pro turns your device into a powerful handheld analysis tool. Navigate through games with the Back and Forward buttons on the toolbar, set up positions with the Position Editor, and turn on Analysis Mode to see the engine's output--just like a chess package for a desktop computer! 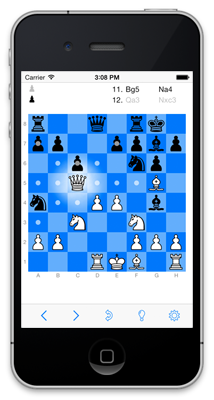 tChess Pro also functions as a full-featured pocket chess reference. Review rules and strategies with Learn Chess, look up opening lines and their names with the Opening library feature, and review databases of famous games (or your own games) with the PGN database feature.